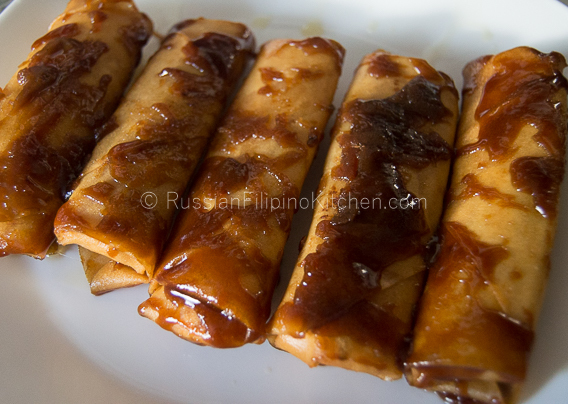 One of the easiest Filipino snack food I learned to make early in life is “turon”. I watched my mom made it so many times that by the time I attempted to do it myself at age 10, it came very easy. 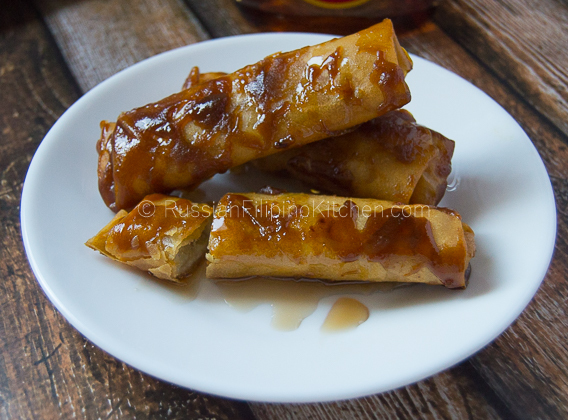 Turon is made from sliced saba bananas wrapped in lumpia wrappers and deep fried in oil with caramelized sugar. Others like to add slices of jackfruit before wrapping, but most do not as the ripe banana and caramel make it sweet enough. 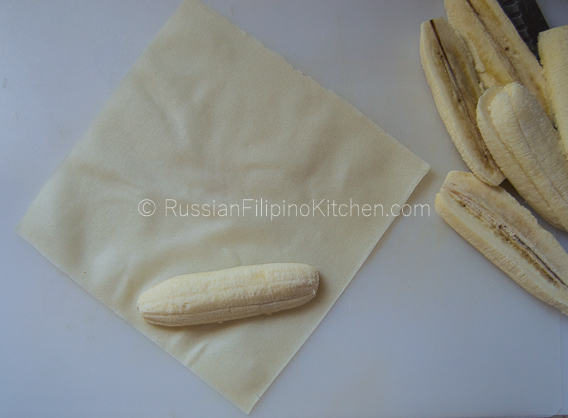 Saba bananas are inexpensive fruit available in Philippines all year round. No wonder several dishes in Philippines use this fruit as an ingredient. It is rich in vitamins and minerals particularly vitamin C and potassium, and also has a good amount of dietary fiber. 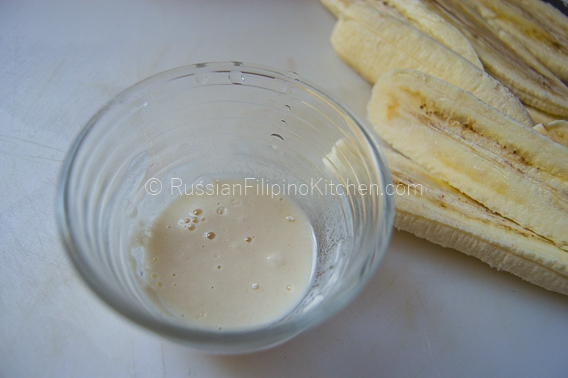 If you don’t have saba bananas, you can substitute plantain bananas for this recipe. Depending on how fast you work, you can make this in as little as 15 minutes. I personally enjoy eating warm turon with ice cold ginger ale. Enjoy! 1. 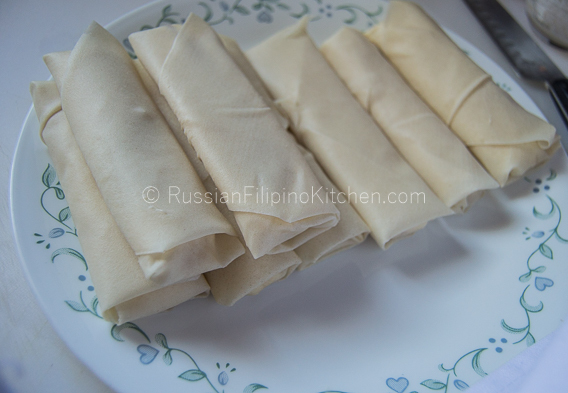 Separate lumpia wrapper one by one (if you haven’t done so) and set aside. 2. 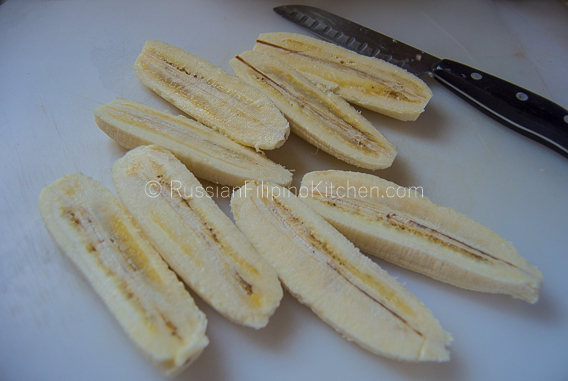 Peel banana and slice in half horizontally to make 8 half slices. 3. 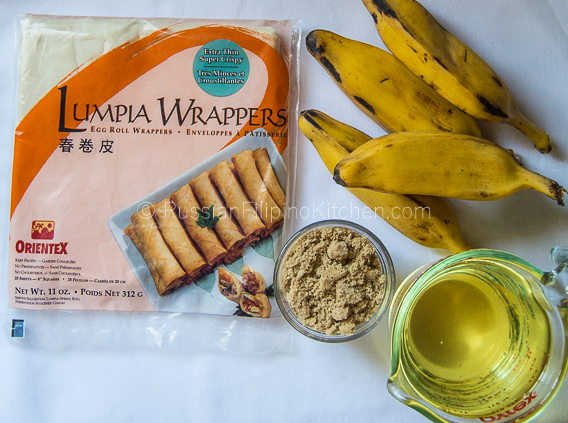 Make a flour paste for sealing the turon by mixing flour and water in a small prep bowl. 4. 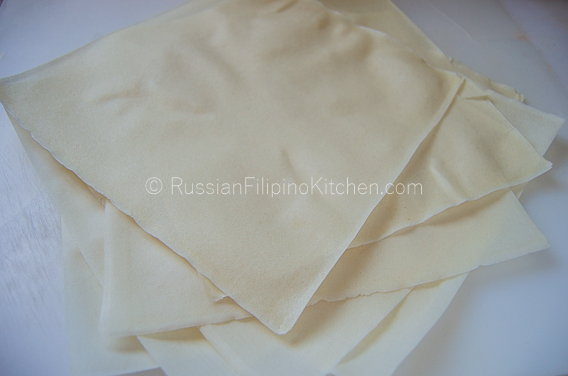 Lay lumpia wrapper flat like a diamond shape with one corner towards you. Place one slice of banana about an inch from the bottom as shown below. 5. Fold once in an upward direction. 6. Fold the sides like an envelope. 7. Roll one more time then wet the top end with flour paste, then seal. Set aside. 8. Repeat steps 4-7 until you finish wrapping all 8 pieces. 9. Pour oil into a frying pan and turn on stove to medium. 10. 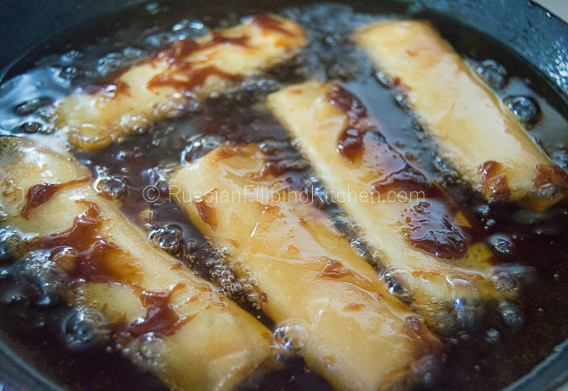 Add the brown sugar after two minutes and wait until it starts to melt and caramelize. Turn down heat a little so you don’t burn the sugar. You will know it’s ready to add the turon when you see the melted sugar floats to the top. 11. Add the turon and deep fry. Turn them over several times to coat with the caramel. 12. Remove from heat once it turns golden brown and transfer to a plate to cool down. I don’t use paper towels to drain the oil because the caramel will stick to the paper. 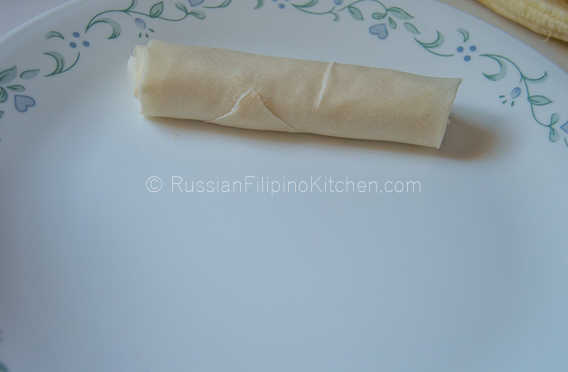 Separate lumpia wrapper one by one (if you haven’t done so) and set aside. Peel banana and slice in half horizontally to make 8 half slices. 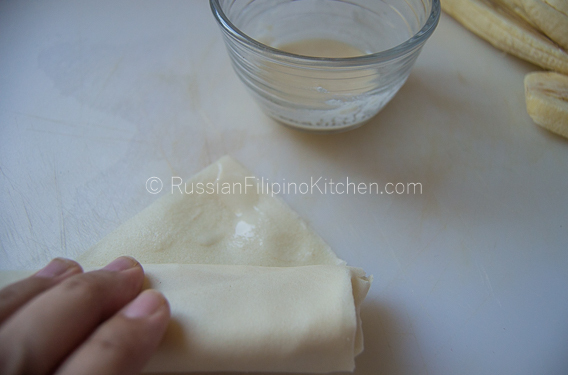 Make a flour paste for sealing the turon by mixing flour and water in a small prep bowl. 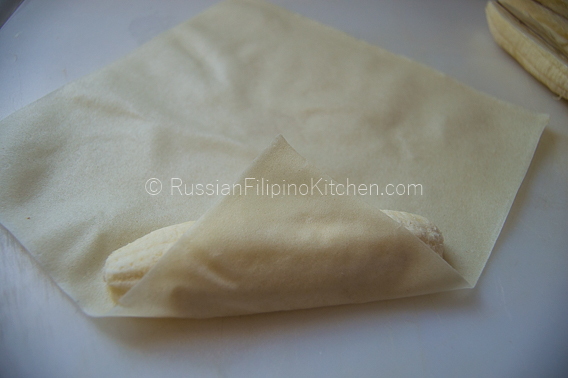 Lay lumpia wrapper flat like a diamond shape with one corner towards you. Place one slice of banana about an inch from the bottom as shown below. Fold once in an upward direction. 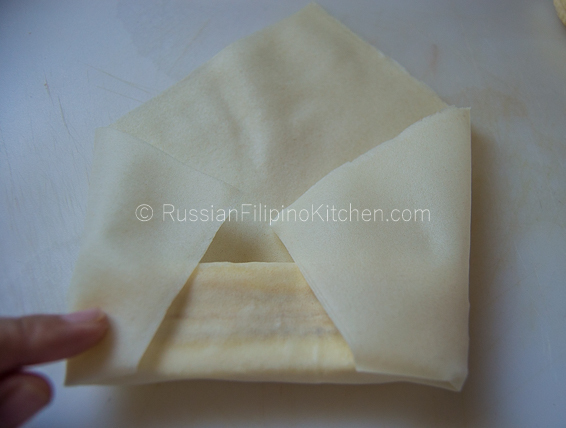 Fold the sides like an envelope. Roll one more time then wet the top end with flour paste, then seal. Set aside. Repeat steps 4-7 until you finish wrapping all 8 pieces. Pour oil into a frying pan and turn on stove to medium. 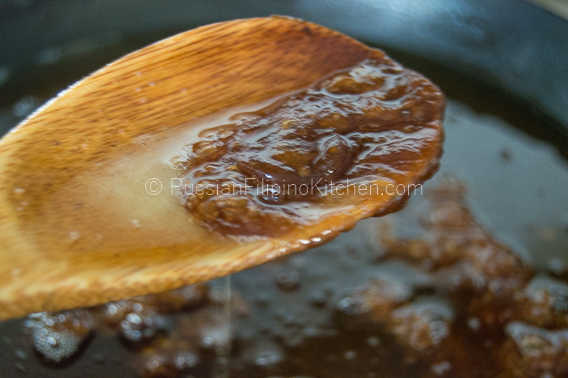 Add the brown sugar after two minutes and wait until it starts to melt and caramelize. Turn down heat a little so you don’t burn the sugar. You will know it’s ready to add the turon when you see the melted sugar floats to the top. Add the turon and deep fry. Turn them over several times to coat with the caramel. Remove from heat once it turns golden brown and transfer to a plate to cool down. I don’t use paper towels to drain the oil because the caramel will stick to the paper. I remember these from my visit to IP as a kid. Thanks for the share – yum!! !